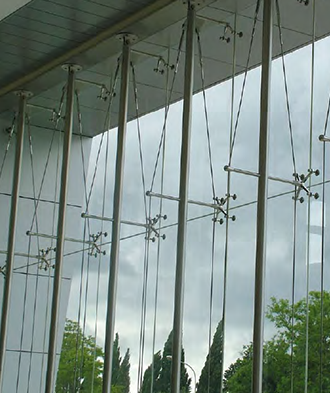 Suspended curtain wall system, composed of an aluminium profile structure, 316 reference stainless steel spiders and tempered or tempered-laminated glass panels, with holes for anchorage to the structure. This system allows a fast and extremely easy application on respect to the cladding, which can also be applied indoors. The advantage of this system is the application of different coating materials: wood, aluminium, ceramics, etc., always using the same form of fixation.